Sony's innovative EyeToy peripheral is the recipient of two solid titles this month with the release of EyeToy: Kinetic and Operation Spy. Kinetic attempts to meld physical fitness with gaming, thanks to collaboration with Nike, and features four separate modes. Operation Spy, on the other hand, offers a more traditional experience with players attempting to infiltrate buildings, unlock codes, and set up surveillance cameras, in addition to some cool action sequences such as sky-diving into a city. While the EyeToy hasn't gotten the recognition it deserves, these high-quality titles definitely show Sony hasn't left owners in the lurch. Read our review and find out why both of these games show off more of the camera's motion-capture abilities in different, yet intriguing ways. This innovative exercise program developed by Sony's London studios offers the promise of a healthier lifestyle thanks to several different workout regimens included. Kinetic's offerings include standard routines along with a few arcade style mini-games to help players stay active. Instead of passively memorizing dance patterns, this sophisticated program tracks the player as they perform the moves, acting as a personal trainer, keeping track of their performance in real time to give them a realistic sense of their progress. The mini-games in Kinetic follow four basic disciplines: cardio, mind/body, and strength. Each of these is represented by one of four unique zones: Cardio Zone, which includes high impact aerobic exercises to increase your overall fitness and heart rate. Kinetic also includes a Combat Zone, which is based on Tai-Chi and Karate, allows you to fight defensively to work on your skills. The game also includes a Mind and Body Zone where you need can exercise your deep breathing and relaxation skills in a dream-like environment to enhance your overall health and finally you can enter the Toning Zone. where you can focus your exercises on specific muscle groups including the upper and lower abs, or upper and lower body. 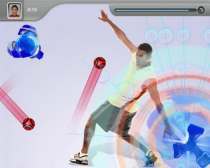 These different modes offer a varied set of exercise regiments, and give EyeToy Kinetic a good range of programs that should allow you to set off on an exercise program without getting bored by doing the same types of exercises again and again. You can set your skill level in each of these modes to your level, allowing everyone from beginners to experts to start an effective workout on their PS2. Kinetic also allows players to measure the force and directions of their movements, to better track and understand their movements. The game allows you to choose from 2 different trainers and allows you to create an in-depth 12 week workout schedule or target specific areas for improvement. This versatility along with the programs advanced motion capture technology allows the player to scale and change the program to create the best training cycle for themselves. While many exercise programs seem to fall short of their promise, EyeToy Kinetic seems to live up to its potential thanks to its flexible structure, ease of use and setup. Kinetic also features support for the new extended Full View camera lens extender, which allows you to lay on the floor and move around the room more freely, this also seems to be a bit more responsive, which is important in any exercise program. While some of the basic training exercise programs seemed a little easy, the later areas are much more challenging and can be quite strenuous, making them harder to complete without breaking into a sweat. 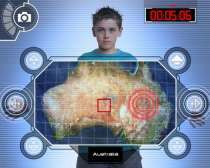 As you'd expect, the game features the clean minimalist style that the EyeToy games have become famous for, with easy to navigate and understand menus making the program easy to use for all types of players. Overall, Kinetic seems to live up to its billing and creates what seems to be an effective regimen that should benefit anyone who uses it. Operation Spy is a decent game that succeeds in taking a more conventional approach to the Eye Toy technology. The game allows players to take one of two paths: Gameplay and Surveillance. In the standard game mode, you're recruited into a top-secret agency known as the SIA, or Spy Intelligence Agency, where you take on various missions in order to increase your espionage skills. In this section, you are tasked with taking down a global spy network in a number of tasks. These include code-breaking, sky diving, disabling spy devices such as bombs, profiling criminals plus others like Photo Fit, World Map, Geosphere and Nanobot to name a few. There are eight unique mini-games included in all, which gives the game plenty of variety. During these games, you can also save your progress and show replays to friends.You also need to master several high-tech gadgets including super-powered cameras that allow you to zoom in on specific locations from high in the sky. These mini-games are all exceptionally well-done and make up a strong storyline that keeps you interested throughout. Their varied tasks keep you on your toes, which allows you to fight the underworld gangs without becoming bored. Operation Spy stronger narrative makes it the most cohesive group of games yet, with an underlying theme that gives you a strong motivation to keep playing. The other half of the game is called Surveilliance mode and allows you to perform some really cool tasks with the camera itself. 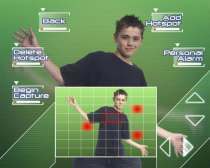 As in the last EyeToy game, you can set uo you camera to keep track and record any movements in your own room and can play these back when you feel like it to catch anyone who's entered your room on the sly. You can also use the camera to play a pre-recorded message that will alert any intruders that they're being watched, or can zoom in to protect predefined areas as well. In addition, the camera uses face recognition technology that players can use to create a unique code or make copies of these recordings and store them onto their memory cards if they want to trade evidence with other gamers. The recording technology is quite flexible as well, allowing player to capture events in Night Vision, Time Lapse or even with still images. After you;ve captured your images, you can even use a USB printer to make hard-copies of the photos. While Operation Spy isn't as deep or complex as some of the more traditional PS2 games, there are enough cool features in the game that make it worth playing.